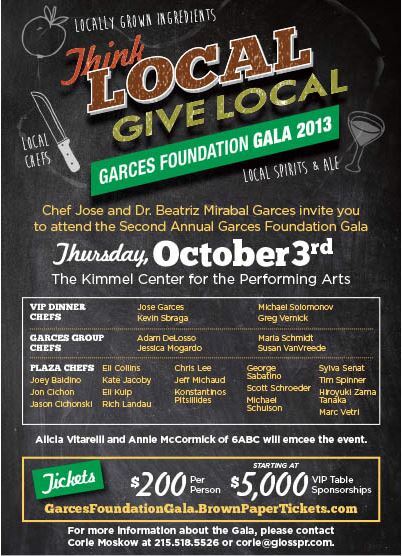 Jose and Dr. Beatriz Mirabal Garces announce that tickets are on sale now for the Second Annual Garces Foundation Gala, to be held on Thursday, October 3rd at The Kimmel Center for the Performing Arts. The Garces Foundation’s goal is to see that Philadelphia’s vibrant and growing immigrant community has access to the care and education they need so that they may actively contribute their talents to making this city truly world-class. The Foundation focuses on impactful and creative responses to specific issues that plague this community. The theme of the Gala is Think Local/Give Local. Chef Garces has handpicked a group of local chefs to deliver an unforgettable epicurean experience, which will highlight Philadelphia’s culinary expertise in the Kimmel Center’s rooftop garden and plaza. Each dish will highlight locally sourced ingredients. Throughout the evening guests will enjoy cocktails made with local spirits, local beer, locally created décor elements and more. he evening will be divided into two parts: VIP and General Admission. The VIP Reception will be held in the Kimmel Center’s Dorrance H. Hamilton Rooftop Garden. From 5:00 p.m.-6:00 p.m. VIPs will enjoy a private meet-and-greet and cocktail reception with all of the event chefs in the Plaza at the Kimmel Center, before heading upstairs to the rooftop Hamilton Garden to enjoy a four-course seated meal by Jose Garces, Kevin Sbraga, Michael Solomonov and Greg Vernick. The VIP dinner will also include a live auction. VIP Dinner seating is limited to 200 people and is only available to sponsors and their guests. General Admission to the Gala opens at 7:00 p.m. Guests will enjoy local dishes by: Garces Group Chefs Dave Conn, Adam DeLosso, Yun Fuentes, Natalie Maronski, Jessica Mogardo, Maria Schmidt, and Susan VanVreede, as well as chefs, Joey Baldino, Jon Cichon, Jason Cichonski, Eli Collins, Kate Jacoby, Eli Kulp, Rich Landau, Chris Lee, Jeff Michaud, Konstantinos Pitsillides, Chip Roman, George Sabatino, Michael Santoro, Scott Schroeder, Michael Schulson, Sylva Senat, Tim Spinner, Hiroyuki Zama Tanaka, and Marc Vetri. The VIPs will join the rest of the guests downstairs at 10:00PM for dessert, cocktails, dancing to the Hip Philly band, and a silent auction. Alicia Vitarelli and Annie McCormick of 6ABC will emcee the event.